This is a charming and romantic restaurant located in Pantai Tengah and just few minutes from the tourist hot spot of Pantai Cenang. While the restaurant is accessible from the main road, you will likely go past without noticing it or thinking that it could actually be a restaurant. 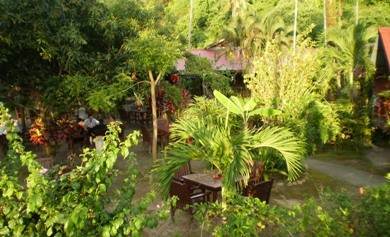 It looks like a private property with a lovely lush tropical garden with many trees and plantations. But once you notice the restaurant sign, then you know that it's also meant for you to have a great dining experience. As you walk along the narrow pathway that leads to the garden, you will pass by many fruit trees like longan, mango, guava, butternut, and even coconut trees. 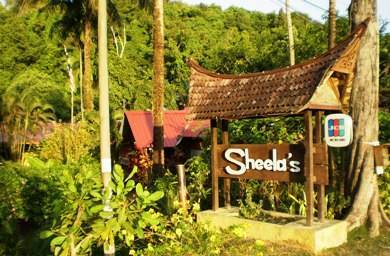 All these have been planted by Sheela herself, the Malay Lady who co-owns this restaurant along with her German husband Willy. No wonder the menu is half Asian and half western. There is also a small lily pond in the garden with plenty of fish in it. Sheela over the years have cultivated this tropical garden which she loves. Her restaurant is open only for dinner and the garden is lit up with lights creating a mesmerizing ambience. There are small wooden tables and cushioned chairs that are laid out in the garden with lots of space between them. You will likely to sit under a tree as you dine. But there is also a roof covered alfresco dining just in case it rains or the garden area becomes full. Even this dining area is created artistically with slanted roofs and many artwork on the walls giving it a rustic yet elegant look. One concern some have while dining in an open garden which is full of shrubs and trees... how about mosquitoes and insects? Well we did find some but nothing to be worried about. The staffs take adequate care and use insect repellents to keep them away. But you may still find some cats and kittens moving about though. They are Sheela's pets. Overall the ambience of the restaurant is great and it's ideal for couples for having romantic dinner in a lush garden setting. So what do you order at the Sheela's? The menu is quite extensive and in general we found most dishes to be very well prepared and portions quite large. If you like to try out the Western fares, some of our favorites here includes the lobster which is soaked with white wine, the Iron Man Salad (huge) or even the Potato Salad, and of course the tender sirloin steak grilled in charcoal & served with mash & some salad. The lamb chops with mash is also a good choice. If you like, try out The Langkawi Delight served with Barracuda fish. Finally finish it off with banana pancake. They keep ice creams as well. In Asian food, there are several great choices. You can start with Tom Yum Soup... excellent. Some of our great favorites here are (could be very spicy for some and they make it to your liking) Mee Goreng Makaam, Nasi Goreng Special etc. The Chicken Satay is excellent and served with rich peanut sauce. But if we have to single out couple of dishes, then that would be spicy fish (they serve snapper) and prawns masak lemak. They also have nice selection of liquors and wine. Overall the service is very friendly. Sheela herself often go around the tables and chat with the guests, and ask them about if they liked the food. Staffs are all well trained and approach you with a smiling faces. Overall the restaurant is good value for money and all items are reasonably priced for its mid range category. I would strongly recommend that you reserve in advance. The restaurant does get full quite often and unlike most other restaurants, they close the doors. This is probably because they just want to handle as many guests as they can and ensure that the quality of service is not compromised. So if you try to walk in, don't be surprised if you see a board hanging on a closed door saying that they are full and can not accommodate any more guests. You may find it strange but that is how they operate. There is no waiting allowed inside the restaurant premises. They accept all major credit cards. They are open from 6pm until 10:30pm. Closed on Mondays.